What do you mean by verified? What are we supposed to do to verify and does it involve uploading of Identification proofs? SUPERSINGH wrote: What do you mean by verified? What are we supposed to do to verify and does it involve uploading of Identification proofs? To be verified you need to have 50 approved answers, have over 10 approved questions, less than 30 answers deleted, and your account must be over 1 week old. It must have a photo, profile details, country of residence etc and the correct social media links. It means your answers won't go to moderation first but although their terms say it will only take 24-48 hours, I applied over a week ago and have heard nothing even though I have met their needs, so I don't know. I've also applied to be verified for weeks now and it is still pending. I don't know the reason because I've met all the criteria. I'm confused as to the reason. I'm going to take advantage of the forum to complain. Tsheza wrote: Look who got verified yesterday!!! Me! Congratulations how long have you been in the site? Hope you can share more the benefits of a verified member from your own experience. 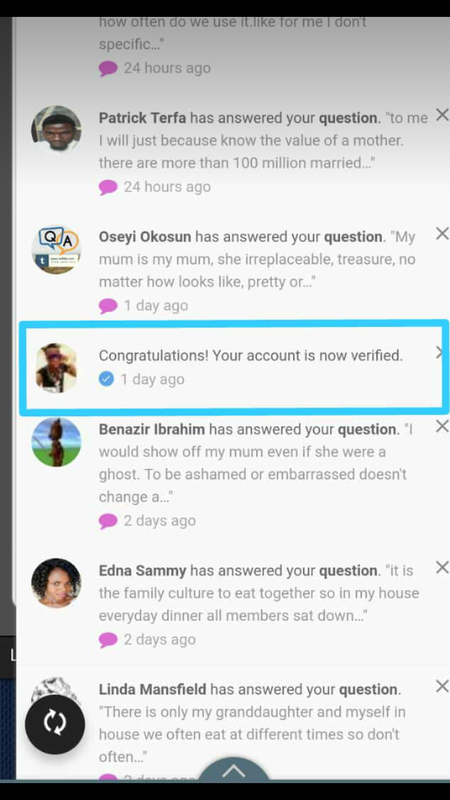 Does it mean your account must be verified before you can start making money from the site and how long does 4th e process takes? You don't have to be verified to start earning. You can start right away, posting and comments will earn you corresponding amount. Just a simple logging in in the site will also give you credits. You can share also a premium link and that is one way of earning when it was clicked then you can have the earned credits. Congratulations on your verification. Mine is taking forever. ahmedo24 wrote: Does it mean your account must be verified before you can start making money from the site and how long does 4th e process takes? You don't have to be verified to start earning. I've not been verified and I've been paid twice. Verification just means that you posts don't have to go through the vigorous moderation before they are posted. It becomes instant. @Kei does this mean that you have been paid by the maximum pay and the remaining will be carried over to the next month? katkat wrote: @Kei does this mean that you have been paid by the maximum pay and the remaining will be carried over to the next month? It means your answers don't go to moderation first but I did ask whether we get paid for more than 5 answers and the moderator said we get paid for the first 5 and then if we choose to do more our account will be compensated in some way. I assume a lesser amount like we get here after the first 10 posts. I am wondering considering the nigeria has no paypal. How come the site is able to issue the paypal payments? They may have used some alternatives to pay because Paypal was not available for bangladesh users and even then admin of FFu was able to send payments. skysnap wrote: I am wondering considering the nigeria has no paypal. How come the site is able to issue the paypal payments? Paypal payment is only for other nationals. They pay through bank to nigerian members. katkat wrote: Paypal payment is only for other nationals. So it may work, I think. With that in mind only, I joined the site. let me see. There are lots who said that they were paid. I haven't reached the minumum yet but I am positive on this. There's no way that they will lie. I see this as a good site. Yes. Your remaining balance will be carried over and you can continue from there. Nigeria can pay you through PayPal. PayPal has only restricted Nigerians from receiving funds. Shopping online, sending money etc is very possible for Nigerians through PayPal. Free Bitcoins • Total Clicks: 51,732 • Total Links: 38 • Add Your Link!